BBQ) Barbecue Ovens - Wood Grill Masonry Oven and Sink. 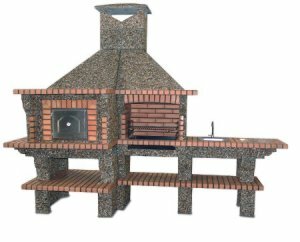 A Barbecue Ovens - Wood Grill (BBQ) Oven and Sinkwill enhance your patio beautifully; the choice of materials, brick design blends well with any garden. These refractoryBarbecue Ovens - Wood Grill (BBQ) Oven and Sinkare very long lasting and extremely durable, high quality product. No Need to paint the Masonry parts. A refractory brick is built primarily to withstand high temperature, but should also usually have a low thermal conductivity to save energy. With incorporated Stainless Steel Grill & removable ash collection tray, this Barbecue Ovens - Wood Grill (BBQ) Oven and Sinkis ready for assembly (DIY) and includes all draws and plans required, no paint needed. This (BBQ) Barbecue Ovens - Wood Grill comes with an Oven and Sink include try the true experience with an outdoor OVEN to make your favorites Pizzas and Bread.